Bake for about 10 minutes or until bottoms of thumbprints are a light golden brown. Remove from oven and while cookies are still hot, use teaspoon to press thumbprint down again if it has puffed up. Let cool completely. 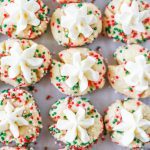 When cookies have cooled, prepare buttercream. In the bowl of a stand mixer, beat butter and powdered sugar together until well combined. Add vanilla extract and pinch of salt. Add 1-2 tablespoon heavy cream until frosting is smooth. Pipe onto cooled cookies with a star tip.